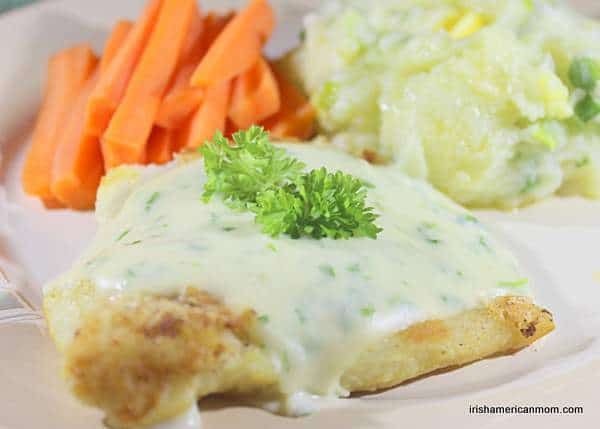 Cod and parsley sauce is a simple, traditional Irish meal, often eaten on Fridays in years gone by when fish was off limits for Catholics. 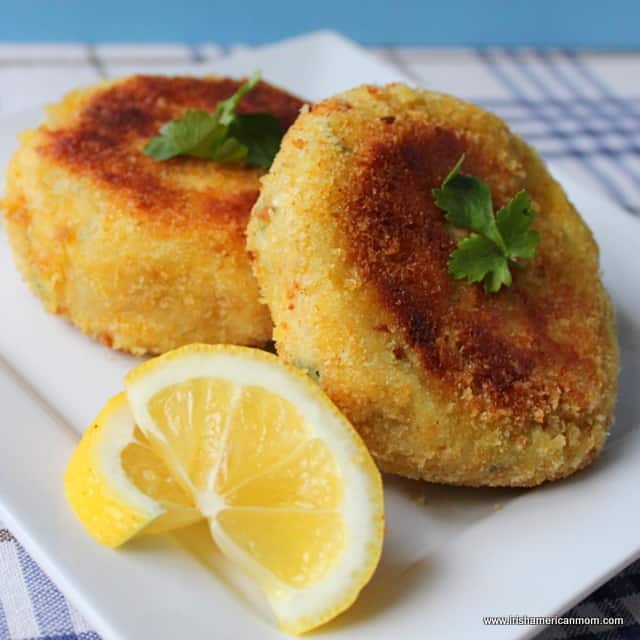 This is a taste of my childhood, and when made with really fresh fish it’s truly satisfying. 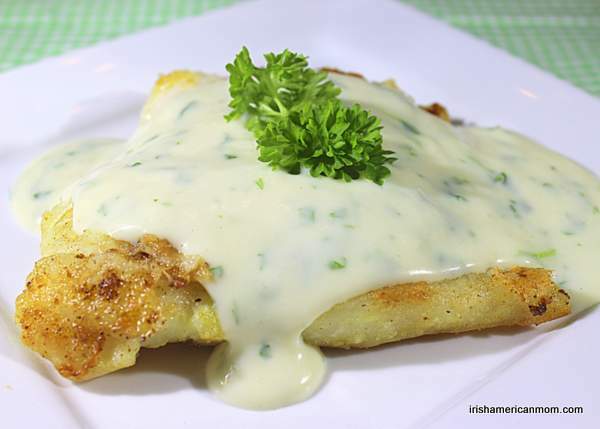 The cod is dredged in seasoned flour before frying, then smothered in a creamy white sauce infused with parsley and a hint of onion. Simply delicious. 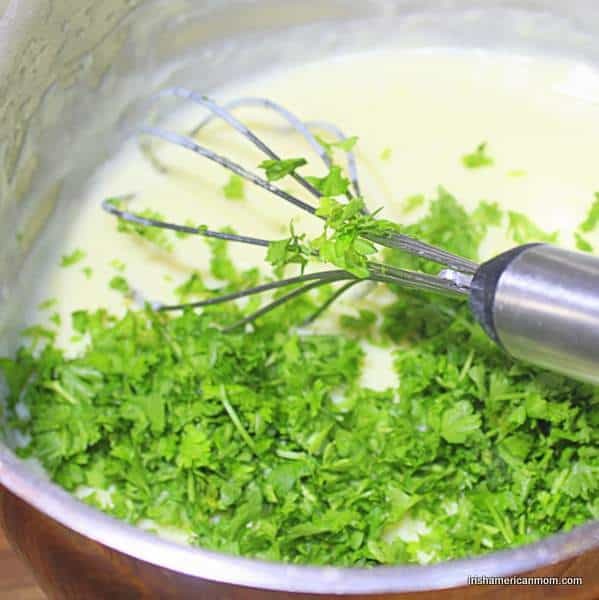 Parsley sauce is a white sauce made form a roux with chopped fresh parsley added. 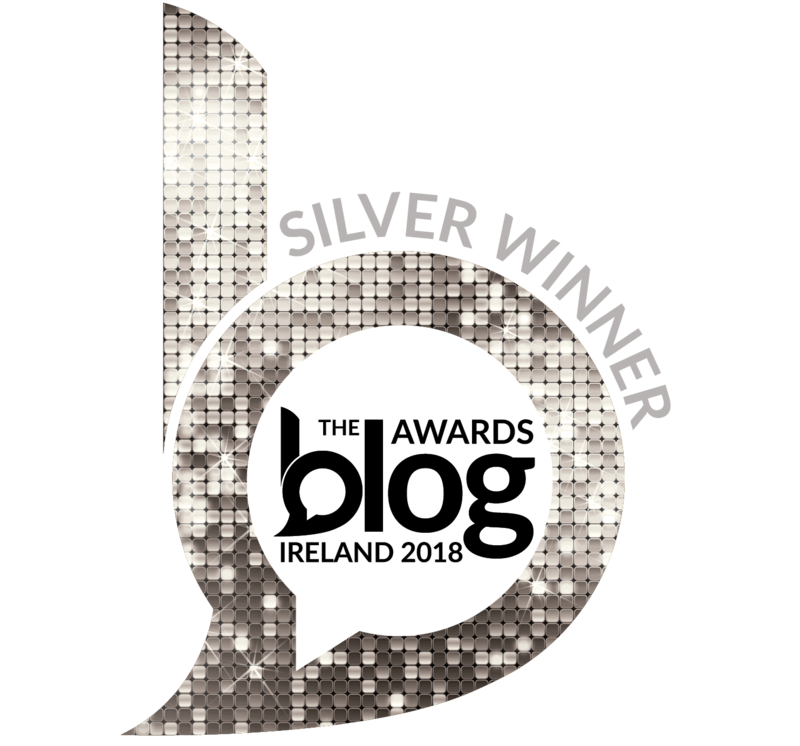 It’s often used in Irish dinners and is perfect for topping ham, bacon or corned beef especially when served with cabbage. I served this cod and parsley sauce with a side of champ, a delicious mixture of mashed potatoes with milk and green onions. A few steamed carrots gave this dinner a real Irish taste and look, with it’s green, white and orange color theme. 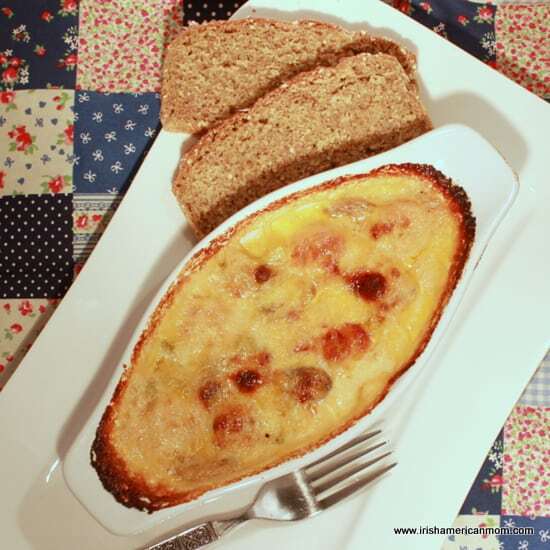 An Irish flag dinner if you don’t mind, just in time for St. Patrick’s Day. 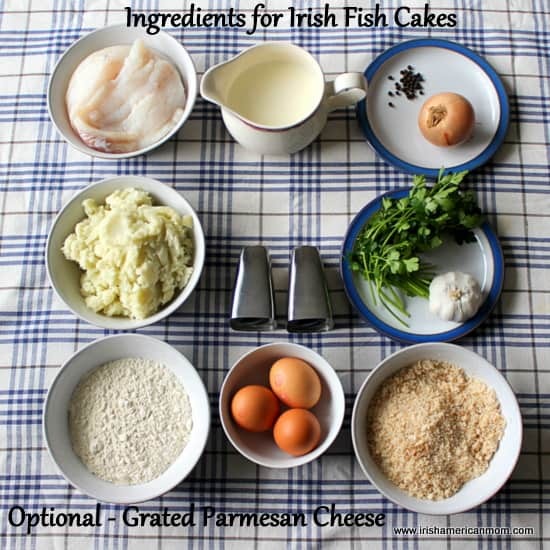 Anyway, without further ado, here’s my recipe for this traditional Irish lunch or dinner favorite. 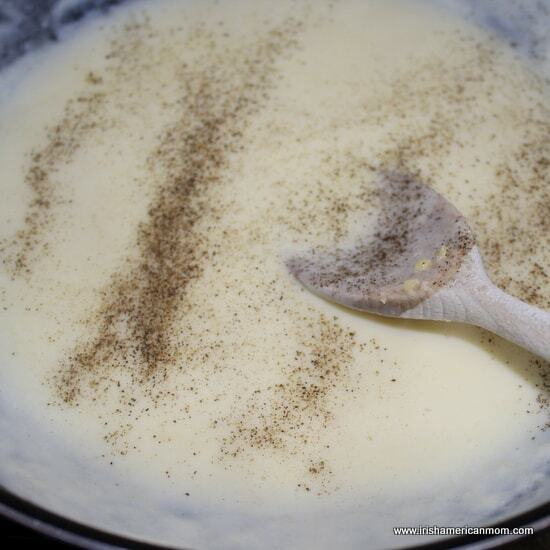 The first step is to infuse the milk you are going to use to make the sauce with a lovely variety of flavors. Onions provide the first flavor layer. Peel the onion and slice half of it. 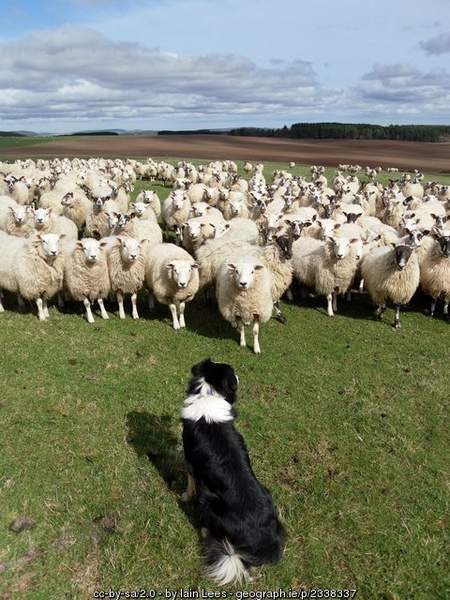 A rough chop is fine. Don’t worry about presentation since the onion will be discarded after it has infused the milk. 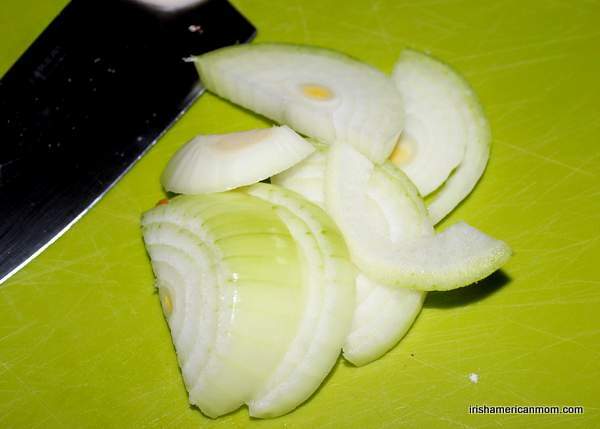 I only use half an onion since I like a subtle hint rather than a bold blast of onion in my sauce. Next add the sliced onion, peppercorns, bay leaf and nutmeg to the milk in a saucepan. Bring it to simmering point over medium heat, then turn off the burner and let it stand for about 10 minutes. 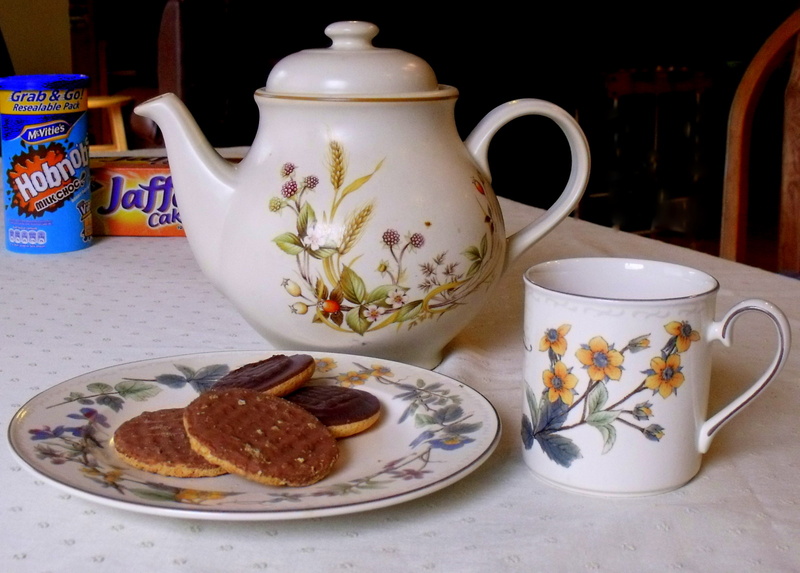 Do not boil the milk, since the flavor will change slightly if it is boiled for a while. 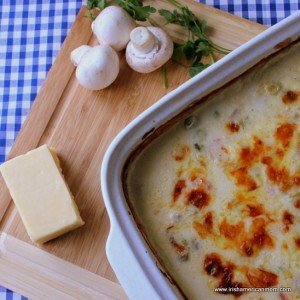 The purpose of this step is to infuse the milk for the parsley sauce with the subtle flavors of onion, bay, pepper and nutmeg, taking your sauce from bland to something extra special. Be sure to use whole milk for the best sauce. 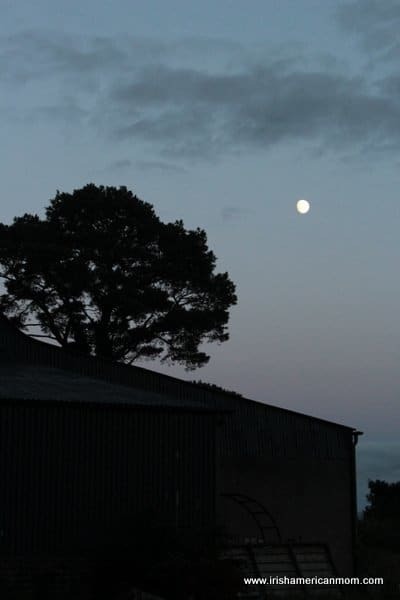 Low fat milks just make thin sauces, so I must recommend whole milk. 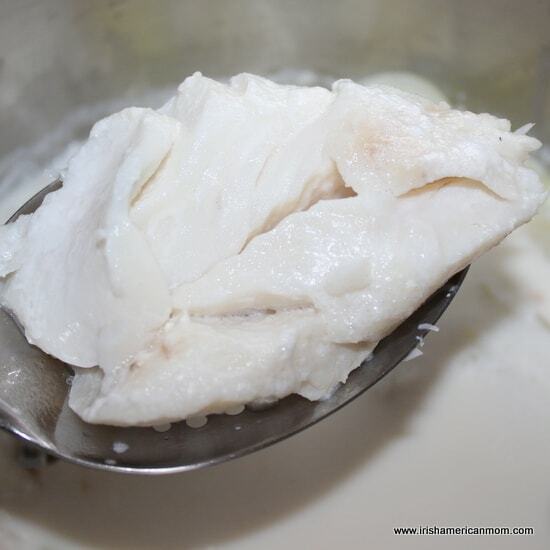 While the milk is infusing with those lovely flavors you can get started cooking the cod. 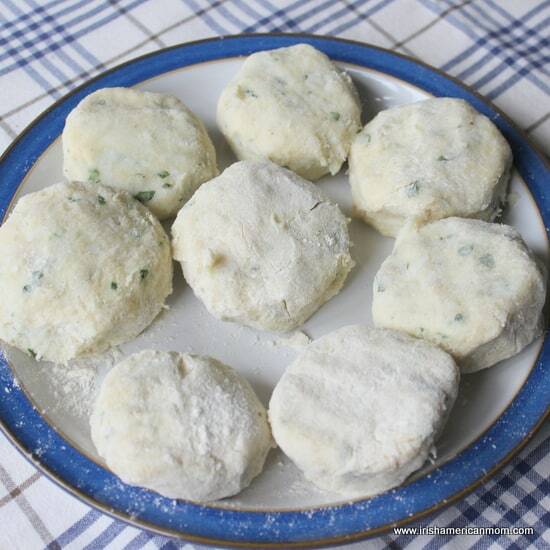 Season the flour with salt and pepper and mix it through in a flat bowl or on a plate. 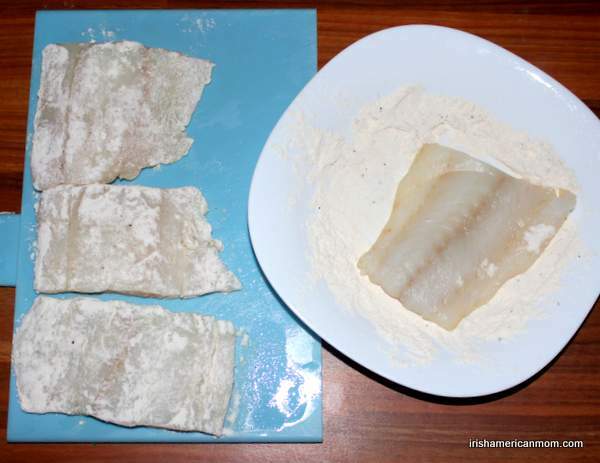 Then dredge each of the cod fillets in the flour. 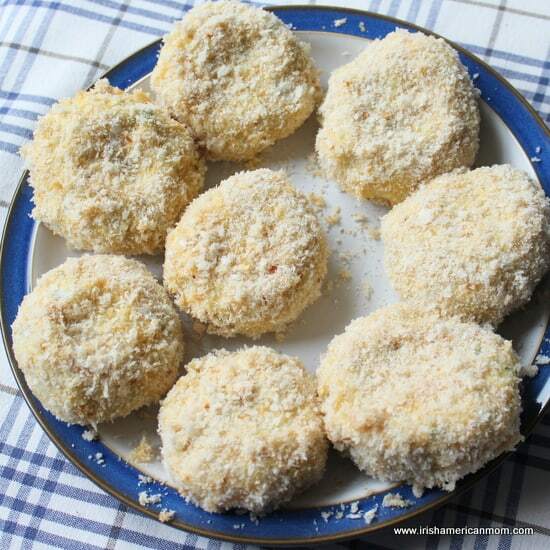 No need to dip the cod in an egg wash before coating in flour. The flour just helps to give the fish a nice brown color when it is fried. 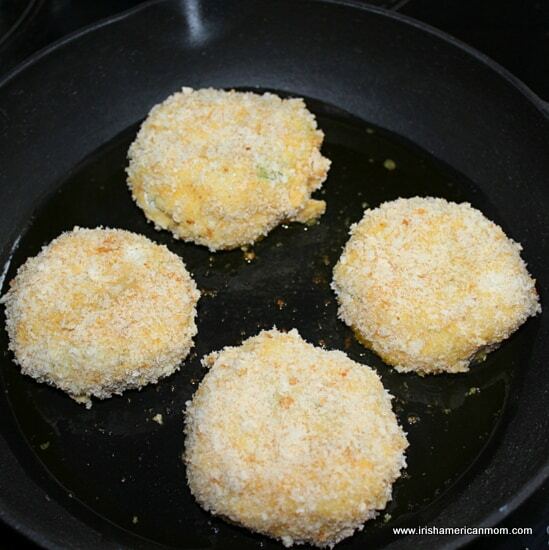 Add the oil and butter to a pre-heated skillet over medium heat. 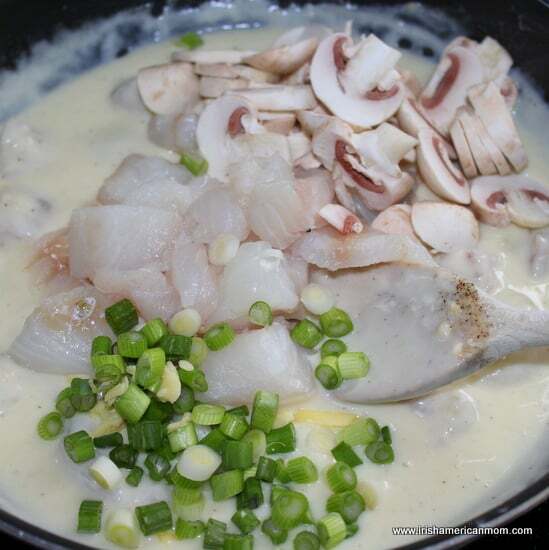 When the pan is hot and the butter is melted add the fish pieces to the skillet. 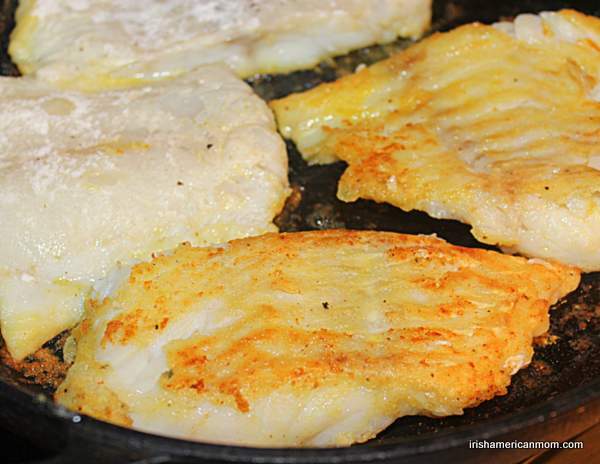 Fry the cod for 3 to 4 minutes on each side, turning when the first side is a lovely golden brown. Once the fish is nearly cooked it’s time to finish the parsley sauce. 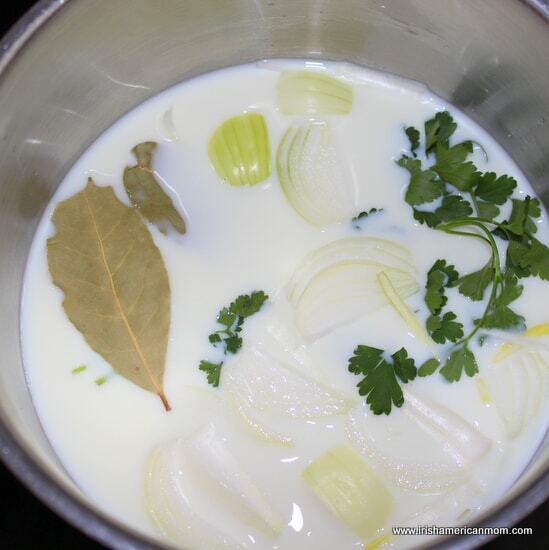 Strain the infused milk and discard the onion, peppercorns, and bay leaf. Keep the hot milk ready for making the sauce. 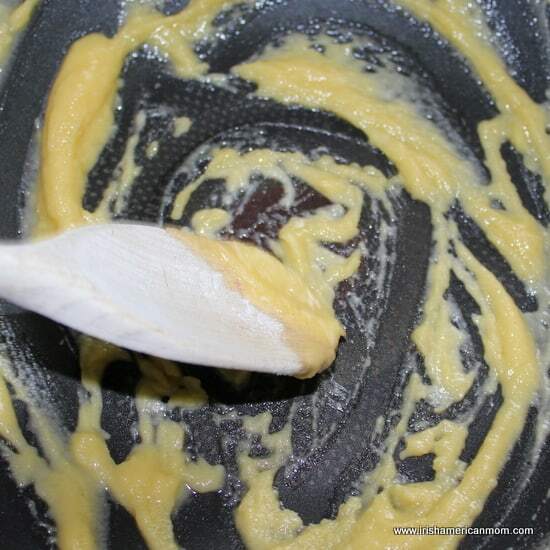 Melt the butter in the bottom of a saucepan. Then add the flour. 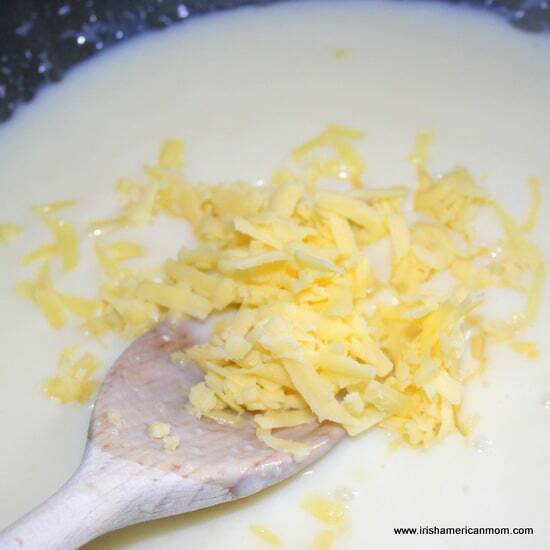 Stir the butter and flour together over the heat for at least one minute. 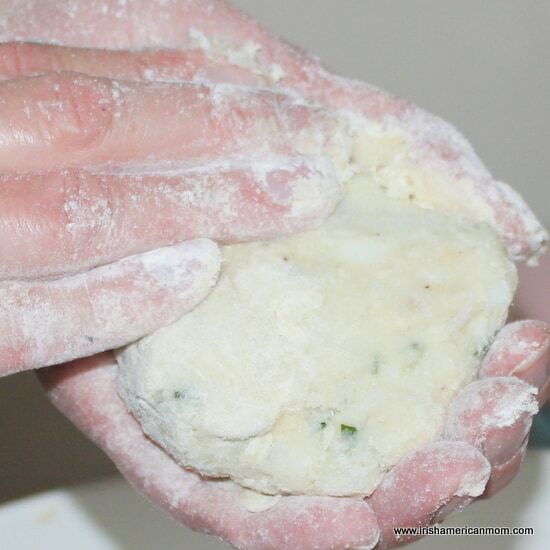 This step is extremely important so that you won’t get a taste of uncooked flour from your parsley sauce. 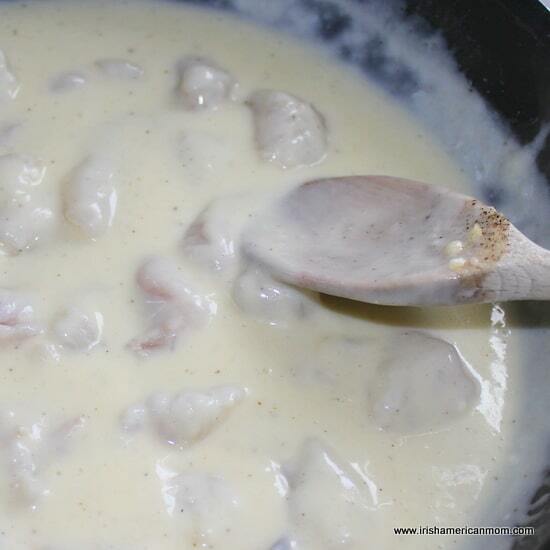 Gradually add the hot milk to the roux whisking all the time over medium heat. 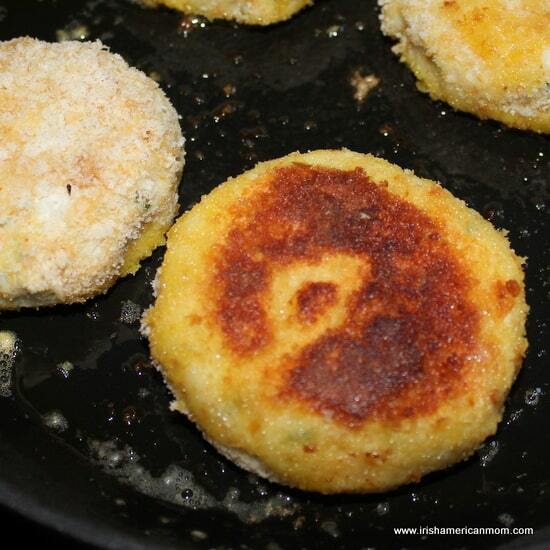 Bring to simmering point while whisking to avoid any lumps forming. 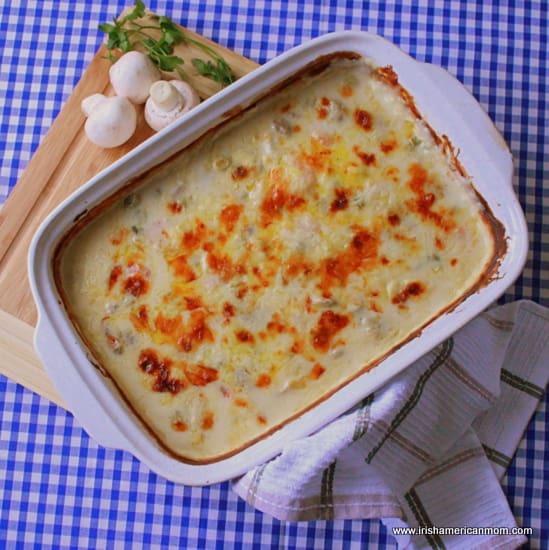 The sauce should be a relatively thick, yet pourable consistency. 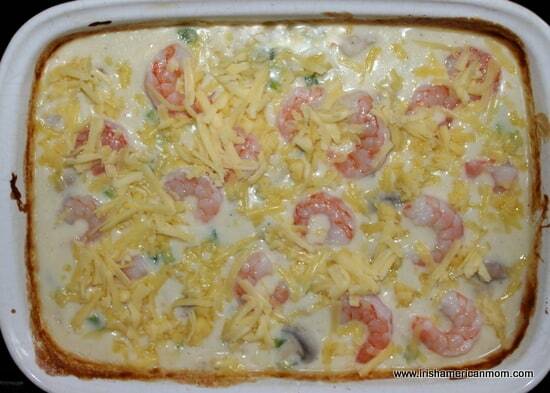 If the sauce is too thick for your liking just add some more milk and stir it through. 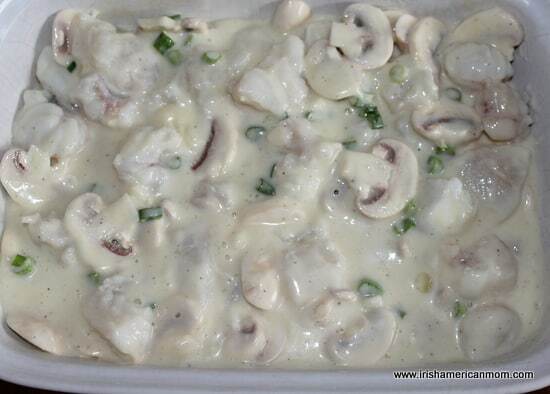 Add the parsley to the white sauce and stir it through. And then you’ll be ready to plate. 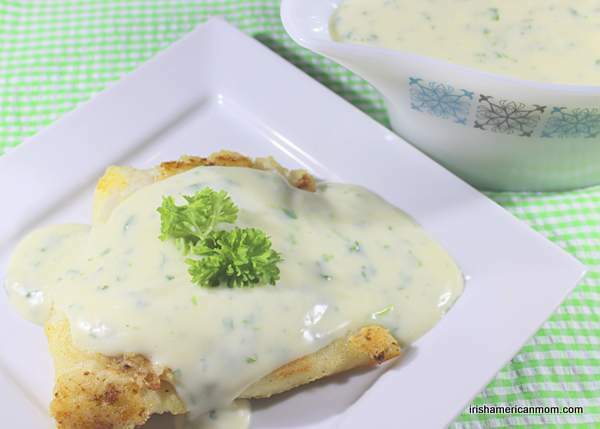 Lay a piece of the cooked cod on a plate and smother it in this lovely creamy parsley sauce. Here’s my Irish dinner complete with a side of champ and steamed carrot batons. 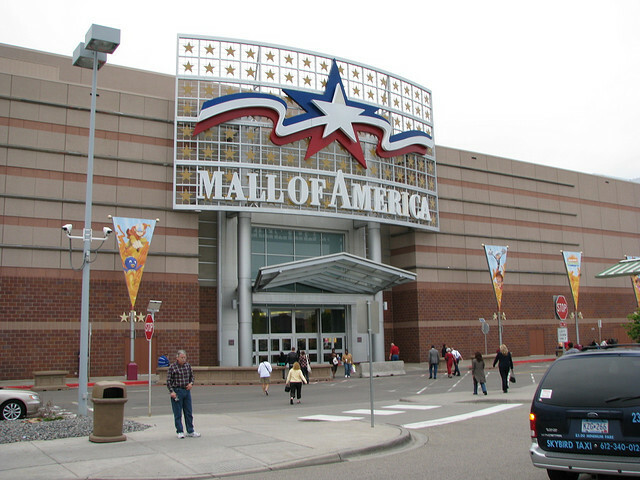 Here’s the printable recipe for those who would like American measurements. 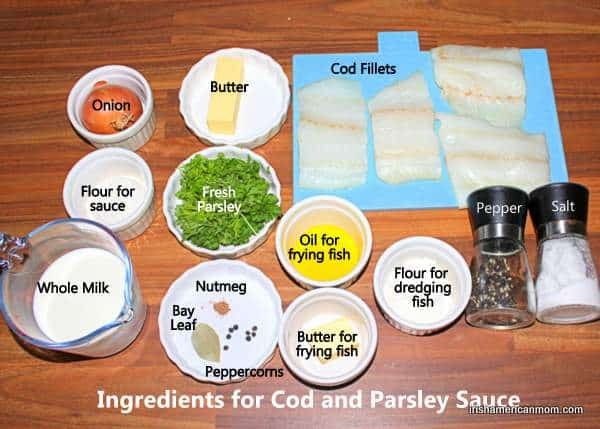 Cod and parsley sauce is a simple, traditional Irish meal. 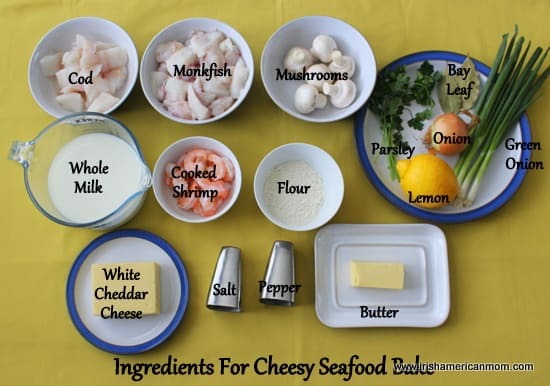 The cod is dredged in seasoned flour before frying, then smothered in a creamy white sauce infused with parsley and a hint of onion. Simply delicious. Peel and slice half the onion. 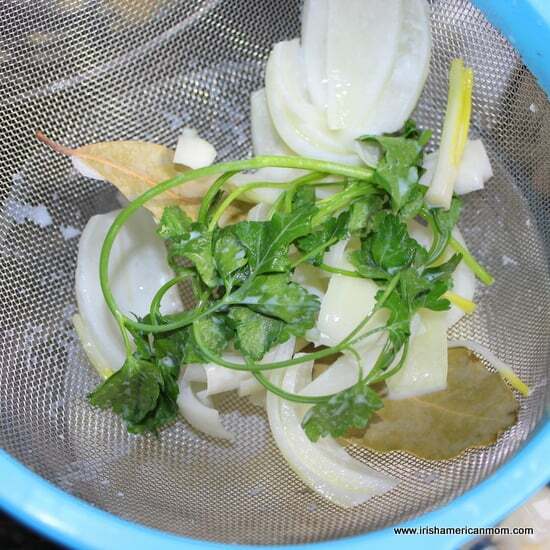 Add the sliced onion, peppercorns, bay leaf and nutmeg to the milk in a saucepan. Bring it to simmering point over medium heat, then turn off the burner and let it stand for 10 minutes. Season the flour with salt and pepper and mix it through in a flat bowl. 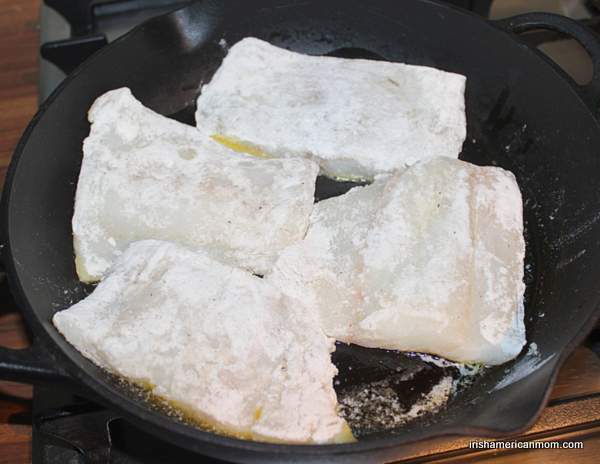 Dredge each of the cod fillets in the flour. Add the oil and butter to a skillet heated over medium heat. 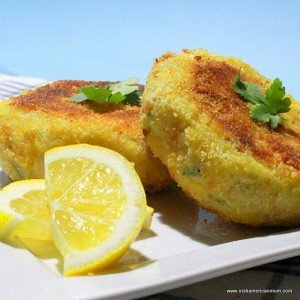 Fry the fish for 3 to 4 minutes on each side until golden brown. 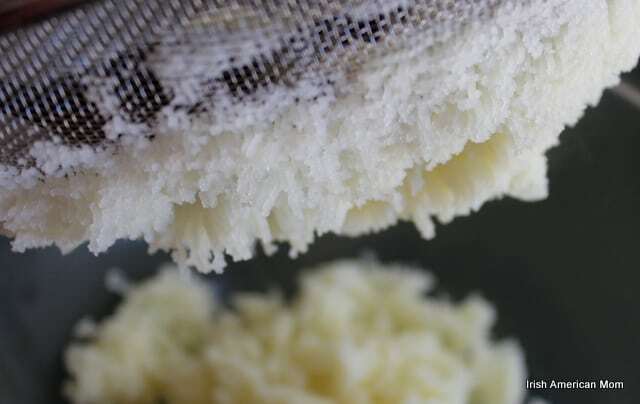 Melt the butter in a saucepan. Then add the flour. 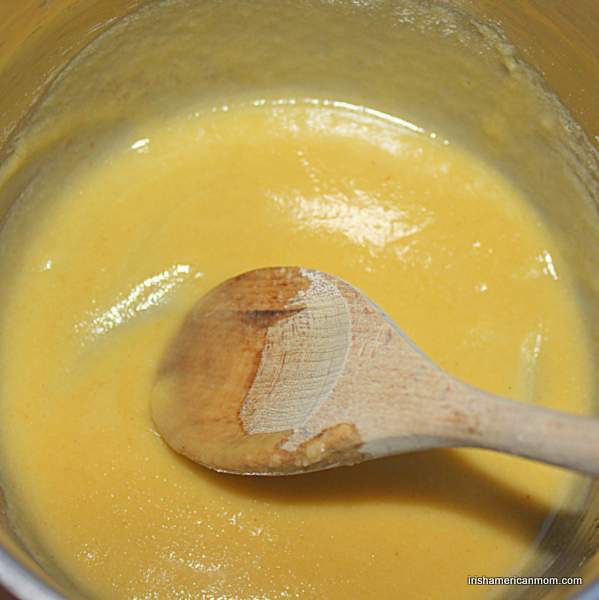 Stir the butter and flour together over the heat for at least one minute. 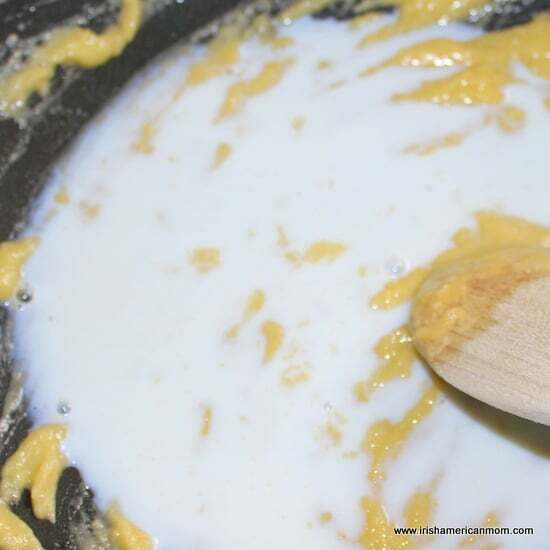 Gradually add the hot milk to the roux whisking all the time over medium heat. Bring to simmering point while whisking. 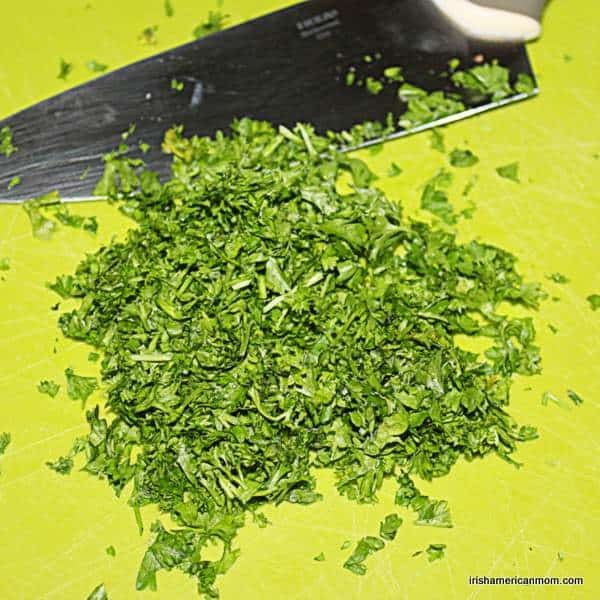 Finely chop the fresh parsley, then add to the sauce and stir it through. 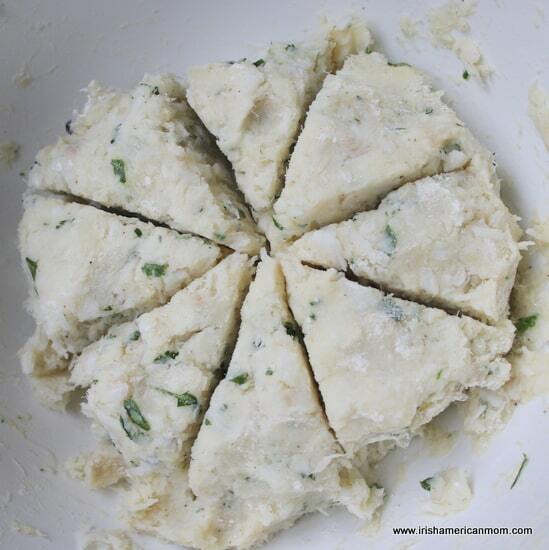 Place each piece fish on a serving plate and cover in parsley sauce. 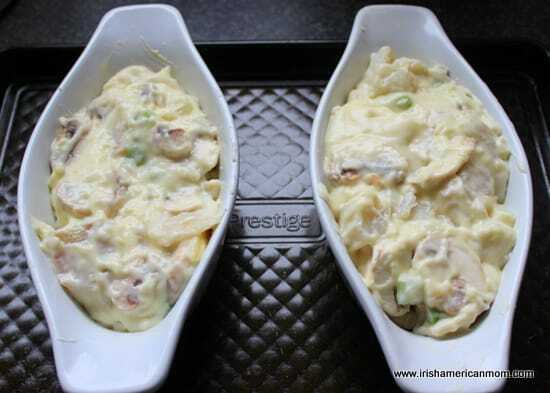 Serve with mashed potatoes or Irish champ. 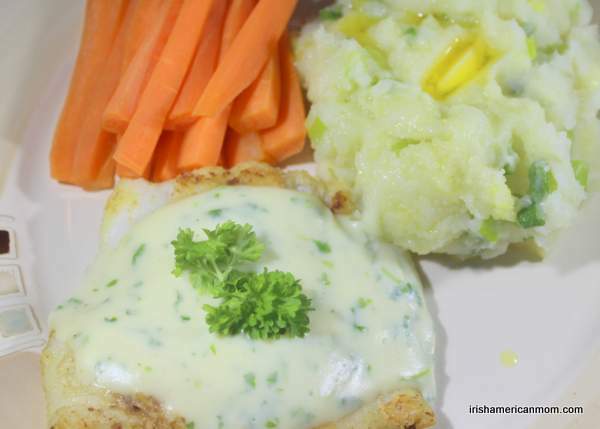 Cod and parsley sauce is a simple, traditional Irish meal. 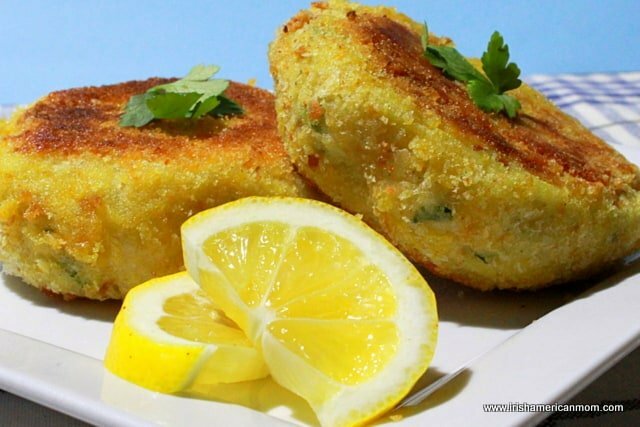 The cod is dredged in seasoned flour before frying, then smothered in a creamy white sauce infused with parsley and a hint of onion. 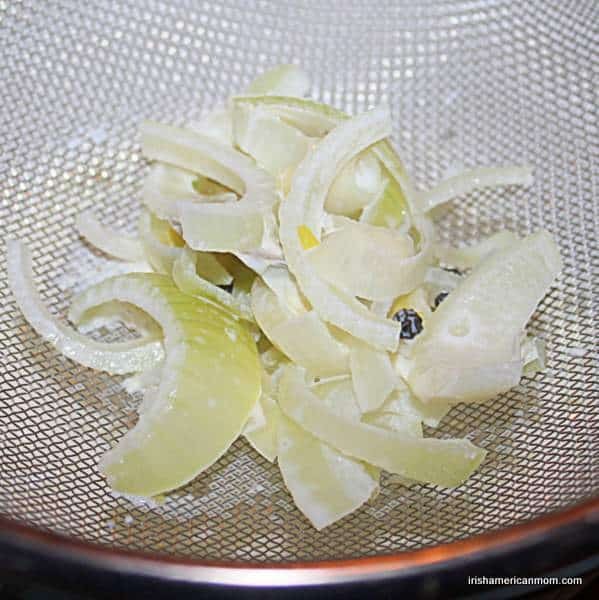 Step 1 Peel and slice half the onion. 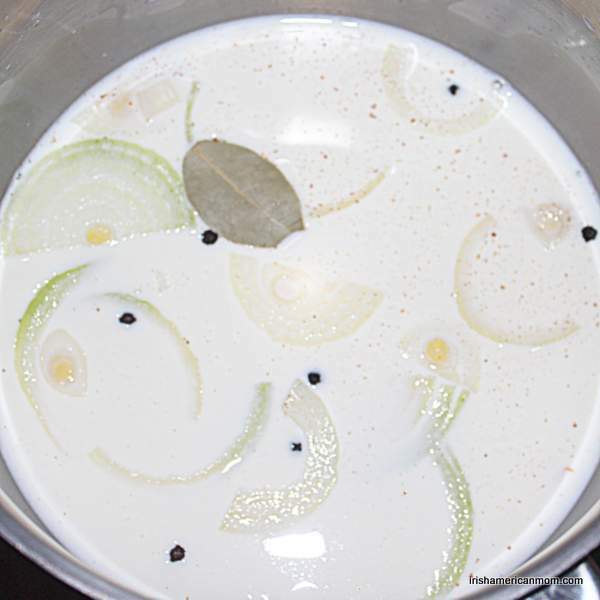 Step 2 Add the sliced onion, peppercorns, bay leaf and nutmeg to the milk in a saucepan. Bring it to simmering point over medium heat, then turn off the burner and let it stand for 10 minutes. Step 3 Season the flour with salt and pepper and mix it through in a flat bowl. 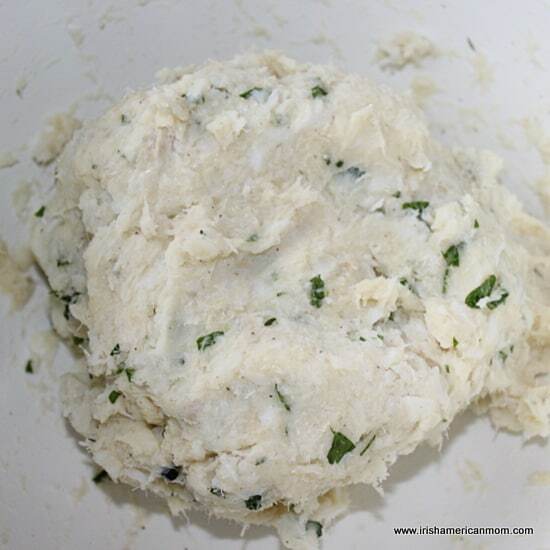 Dredge each of the cod fillets in the flour. Step 4 Add the oil and butter to a skillet heated over medium heat. Fry the fish for 3 to 4 minutes on each side until golden brown. Step 5 Strain the infused milk and discard the onion, peppercorns, and bay leaf. Keep the hot milk ready for making the sauce. Step 6 Melt the butter in a saucepan. Then add the flour. 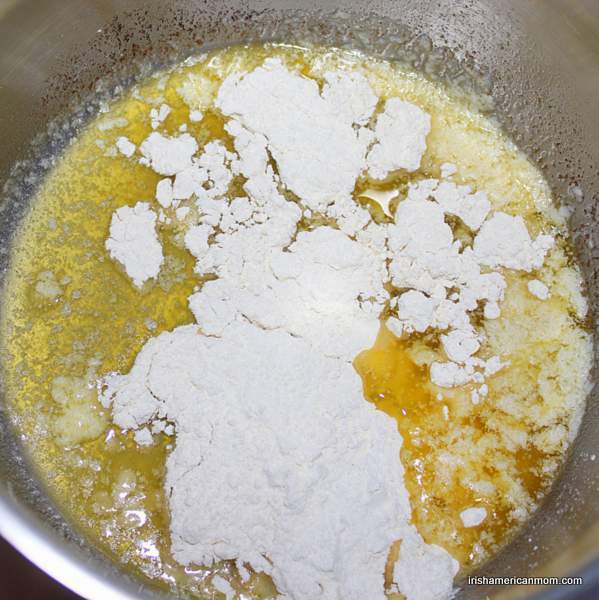 Stir the butter and flour together over the heat for at least one minute. 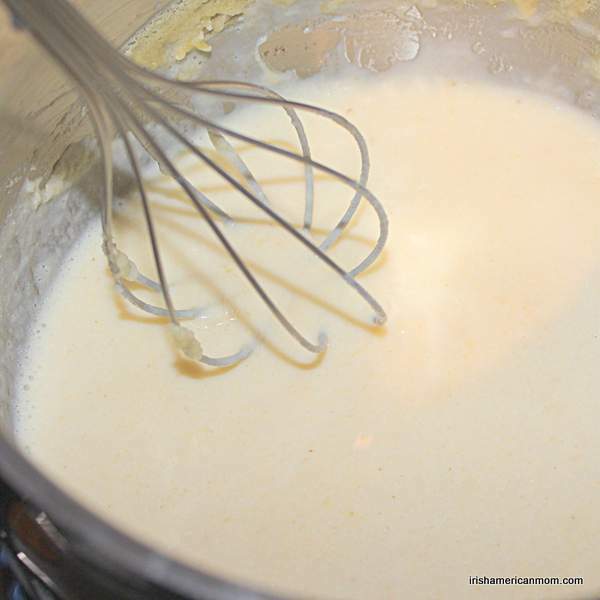 Step 7 Gradually add the hot milk to the roux whisking all the time over medium heat. Bring to simmering point while whisking. Step 8 Finely chop the fresh parsley, then add to the sauce and stir it through. Step 9 Place each piece fish on a serving plate and cover in parsley sauce. 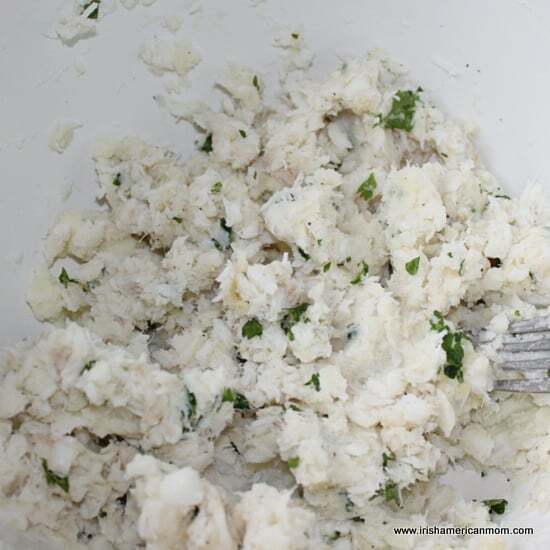 If you would like to serve champ with your cod and parsley sauce just click here for my Irish champ recipe. 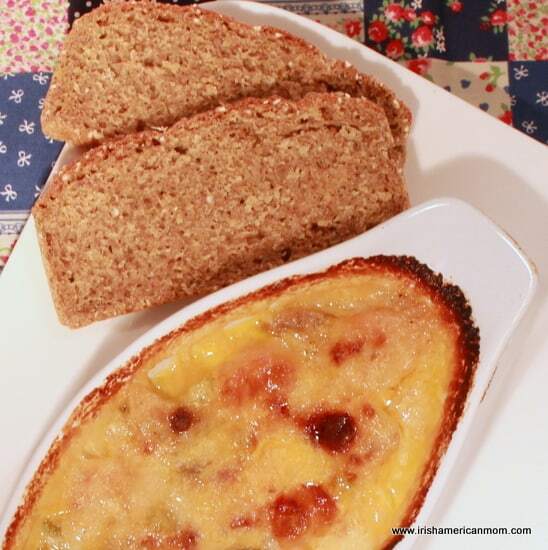 Happy Irish cooking to all.